Our friendly customer service team is always happy to hear from you. If you need some help finding the right 2 seater garden furniture for you, don’t hesitate to give us a call. The Lazy Susan team can give you more information about our range of 2 seater bistro sets, and discuss which models might best suit you. We can also provide more details about our (free!) delivery, and arrange free samples of metal and fabric to be sent to you. Feel free to send us an email, too. We aim to get back to your emails within 2 hours during our office hours. Our bistro tables and chairs come in various shapes, colours and even materials. 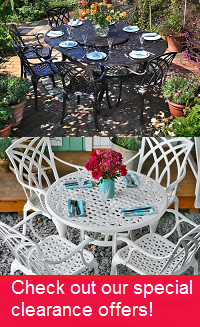 We’re specialists in cast aluminium, and many of our metal bistro sets are aluminium. But we’ve also got steel bistro sets. These are usually folding chairs and tables. They’re a practical choice if you want to clear your table away when not in use to make the most of the space in your patio. Our other models are robust and weatherproof cast aluminium bistro tables. They can be left outside all year round and come out the other side of winter looking as good as they did before. They won’t rot or split, which are risks that come with wooden garden furniture. They won’t rust either, which can be a problem with cast iron furniture. So take a look through our 2 seater cast aluminium furniture, secure in the knowledge that sanding, varnishing and other maintenance won’t be necessary. Your outdoor bistro set will be virtually maintenance free, giving you more time to enjoy your garden. The Ivy table features beautiful, detailed metalwork across its 63cm table top. It weighs just 13kg and so can be moved around the patio with ease, or even brought up onto a balcony. It comes in Antique Bronze, Slate Grey, and white. The Rose bistro set is a gorgeous and ornate aluminium bistro set whose detail extends from the table top down to the legs and stretcher. It has a diameter of 65cm and comes with the stylish, matching Rose bistro chair. Another compact 2 seater garden table set is the Ella bistro set. This is the perfect bistro set for a small patio or balcony, with a diameter of 60cm. Compact yet sturdy, the cast aluminium Ella bistro set will survive the elements just as well as our larger aluminium tables. We now come to a metal bistro table that differs from those we've mentioned so far both in shape and material. The Zara bistro set is a square shaped folding bistro set made of steel. It's a simple and elegant 2 seater garden furniture set, perfect for those who want to make the best use of their space by being able to fold away their table set. Some of our bistro sets come with folding chairs, and others with a standard 'bistro chair'. Then there are our 2 seater table sets. Those labelled as a table set come with a choice of chairs. So once you’ve chosen the right 2 seater garden table set for you, select which chair you prefer. A default chair will be available at no extra cost, but take a moment to consider others, such as the Emma, Rose, Georgia or Abigail chairs. You can pair one of these other chairs with your square 4 seater table for between £5 and £25 per chair. These garden chairs are made of the same weatherproof and robust cast aluminium as the tables. Your 2 seater garden table and chairs will be much more enjoyable when enhanced with a few accessories such as cushions and a parasol. Underneath the section where you choose your chairs, you’ll find offers for cushions and parasols in various colours. Purchasing these in combination with your garden furniture set allows you to save 70% on them compared to buying them separately, so don’t miss out! Those aren’t the only available offers. You can also get between 20% and 80% off various aluminium garden furniture items such as a bistro set or sun lounger. But these offers will be unique to this page, so combine them with your main order to take advantage. We have some outstanding deals on our clearance page, too. These standalone deals apply to everything, from side tables to 12 seaters. They change all the time, so check back regularly, and if you see a bargain on something you like, get it while you can! Delivery is free on all our 2 seater cast aluminium garden furniture. So there’s no need to worry about extra charges on the checkout page. Our aluminium garden furniture sets are delivered as a large package or on a wooden pallet by our partner couriers Parcelforce or Geodis. Both offer online tracking of your order from the day of dispatch. Geodis will also call you the day before delivery to arrange a time slot that works for you. For details about delivery you can have a look at our delivery information page or give us a call.